After sewing up my last Beauty cowl top, I had to make another one! So comfy! 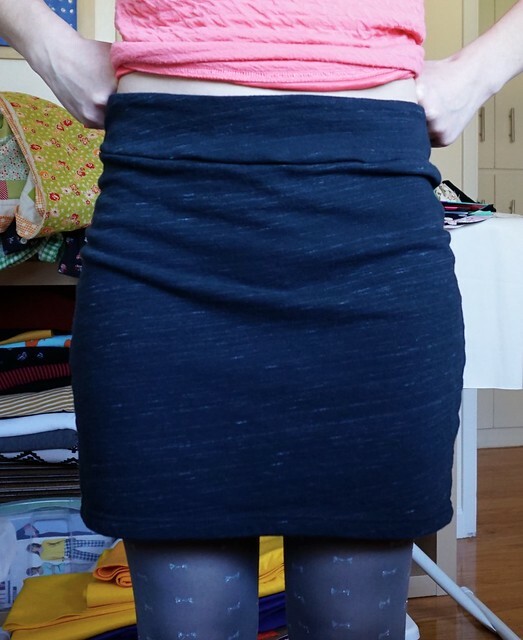 I used a french terry knit I found at Fabric Outlet in San Francisco. It was so incredibly cheap. 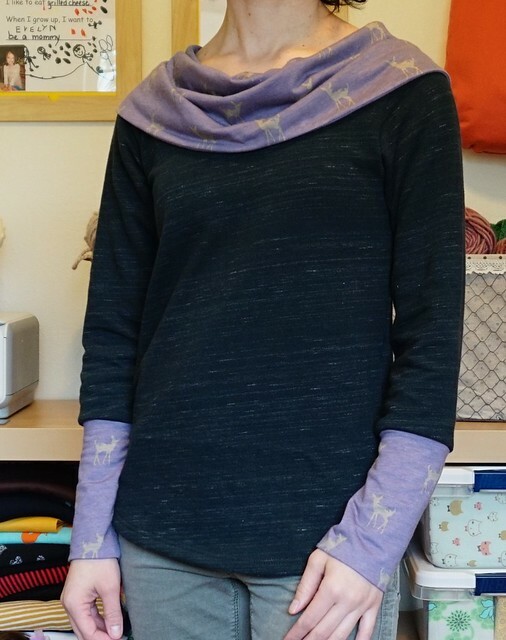 I didn’t have enough for the whole top, so I made the cowl and sleeves with a cute print from Girl Charlee. Adorable little deer! I did make a bit of a change to the sleeves. I chopped off 6″ more from what I initially hacked off, then I cut my coordinating knit fabric 14″ long by 9″ wide to make the cuffs. I left the bottom band off again. 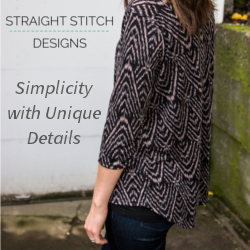 This really is a quick top to make! 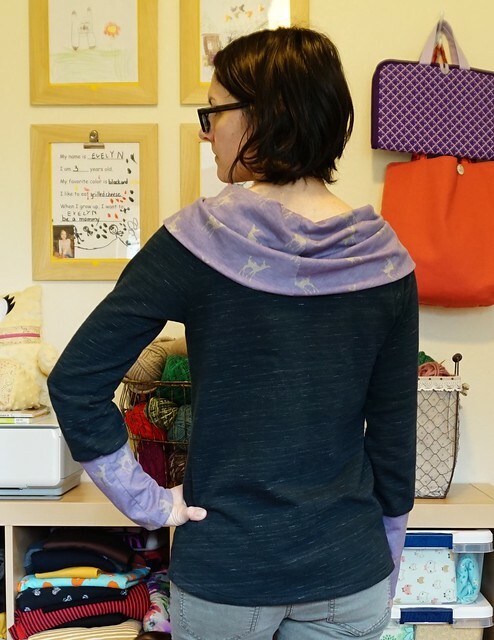 Before I made the cowl top though, I used some of this french terry knit to make the Mabel by Colette Patterns. It’s an easy pattern that I had bought during their sewalong and never got to it. I had it cut out when I weighed more, a size small, so when I was done, it was a little big. I took it in 1/2″ on each side. I would probably go down to an XS next time. It has a seam in the back, which makes it nice and easy to make fitting changes. The problem with this fabric though is it doesn’t have any lycra or spandex, so there’s NO recovery. 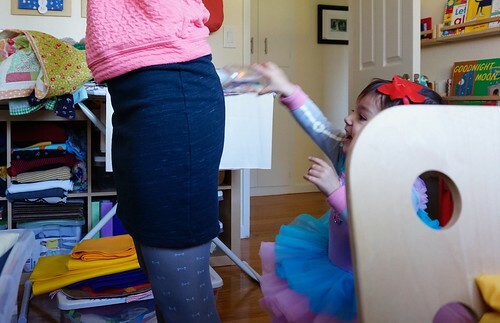 By the end of the day, this skirt is falling off of me. I think it might be best as a bathing suit cover up, at least for the bottom half! It is easily constructed though, and seriously takes almost no time at all. I used my serger for the seams and coverstitch for the bottom hem. Thanks! I love wearing it. I know there are more in my future! It looks really good! I’m wanting one too!